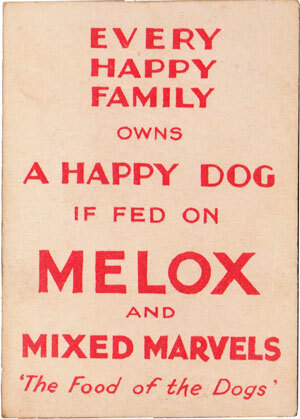 The “Game of Happy Melox Families” children's cards was published by G. Clarke & Son of Thomas Street, London, in 1929 to promote Melox dog food. The families are represented by seven breeds of dog, shown engaged in leisure activities such as playing sports, answering the telephone, reading or playing with toys. 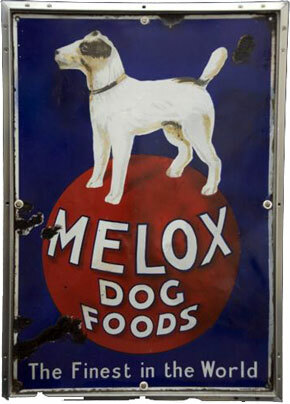 ← Left: enamel advertisement sign, 1920s. 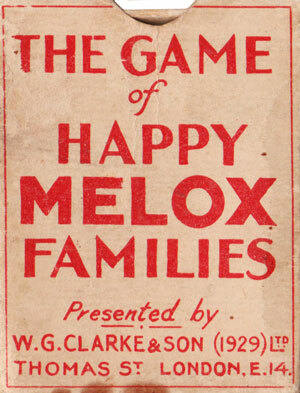 Above: the “Game of Happy Melox Families” children's cards published by G. Clarke & Son, 1929. 32 cards in box, size: 73 mm x 52 mm. Images courtesy Rex Pitts.